Songs performed in Music Halls were entertaining but they couldn't help but be influenced by fundamental principles held by performers and audiences. 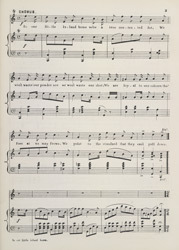 There were always strong regional elements in Music Hall songs but those with national themes became especially popular during the 1880's and 90's. The lyrics of 'In Our Little Island Home', speak of the heroes in the British army who have defended their country with pluck and courage. Songs personalised society focusing on policemen not the police force, miners not coal mining and here on soldiers rather than war.